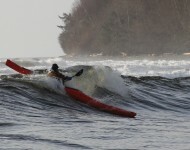 A look into what we love about Rough Water Paddling and such. With some great shots and some insightful questions. 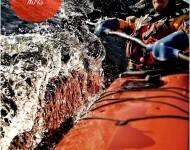 Active Sea Kayaking travels around the world, on magazine at least! on the Cover of Paddle Mag, the Australian paddling magazine, for a surfing shot…. Free PDF download for everybody! A very interesting article in the Globe and Mail about The discovery Islands getting logged again…. Images of narrow sea channels backed by towering, thickly forested mountains have long been featured in government ads promoting tourism under the slogan: Super, Natural British Columbia. Kayaking around Tierra Del Fuego…. Some sweet surfin in the sun….